In 2012, Dr. Roberto Mangabeira Unger, Roscoe Pound Professor of Law, Harvard University Law School lectured at the David Rockefeller Center for Latin American studies on Brazil and the United States. Not only was it a thought provoking seminar on Brazilian studies, it summarizes quite concisely similarities and variances between the two countries. Unger presented a theses concerning the shortcomings of both countries and offers distinct reasons that support his argument. To begin with, he argues that both the US and Brazil lack sustainable policies that uplift the masses of ordinary men and women in their respective countries. He discusses something he terms the “sentimentalization of unequal exchange” and how it targets, isolates and marginalizes segments of their societies. As a segway into his discussion, he begins by explaining the similarities of both the US and Brazil. For example, he states that both countries were settled by Europeans and built by the labor of slaves. Also, both are multi-ethnic, multi-cultural countries and they both are largely Christian. He also points out that the US has the largest degree of inequality among the first-world, industrialized countries while Brazil has the largest degree of inequality among the emerging or developing countries. But probably most important, both countries are loyal to the idea of democracy through “faith” in the abilities of the ordinary man and woman. Then, he turns to the significance of the differences between the two countries. He starts by describing how American consciousness asserts the belief that the US has discovered the “definitive” formula for a democratic society. A formula that the rest of the world must subscribe to or continue to live in poverty and despotism; how this formula may be “adjusted” but not “reinvented” but mostly that this idea cannot under any circumstances be exempted. In fact, he states that the problem for most Americans is they idolize their institutions. While on the other hand, he states that Brazilians have the tendency to copy their institutions from other countries such as Portugal, England, France, or the US – that is, their institutions are not originally Brazilian. They seem to believe that anything that comes from outside of their native Brazil is always better. He states that Brazilian consciousness can be divided into two groups: (a) those that believe in always taking the most advantageous position available; and (b) those that believe Brazil should be like other countries (such as Britain, France, or the US). In addition, he states that Brazilians believe in the idea of greatness with tenderness – the age old example of pagan greatness and Christian love. He continues by stating that Brazilian society is fundamentally based on the institution of social power and allegiance or in other words the “patron-client” relationship. Apparently referring to the “patrón-peon” relationship and how a large portion of the Brazilian population wants to escape from this idea of social life (due no doubt to the manner in which “peons” are demeaned and degraded through this relationship). Moreover, he describes these interlocking processes as the sentimentalization of unequal exchange. From Unger’s point of view, the problem for both the US and Brazil lies in a misunderstanding of the relation between the making of the individual and the construction of a democratic society. A society in which Americans or Brazilians are not excluded from economic or educational access that would enable social mobility and prosperity. He states that these forms of consciousness and empowerment represent different ways of evading the problem of “structure” and the transformation of structure. More important, perhaps, is the fact that the transformation that is currently taking place is in the form of social exclusion rather than inclusion and creates a vast distance between classes of people, and this transformation has become a new source of massive inequality and exclusion. To support his argument, Unger cites the example of US President Franklin D. Roosevelt and the series of domestic programs between 1933 and 1938 known as the New Deal. At that particular time, the US was experiencing the Great Depression: the economic fabric of the US had collapsed; people from all ethnic groups were unemployed and suffering tremendously; it was the worse economic period in the history of the country. The New Deal was an initiative that not only pulled the US out of economic depression but also put people back to work. It was a plan that affected Americans across all classes, ethnic and religious backgrounds; it was an “all-inclusive” transformation of the structure of US society. Moreover, it fulfilled the promise of the institution of American democracy. However by 1964, a series of events began to take place that decreased equality, political engagement and the association of social capitol. First, President Johnson initiated the War on Poverty that singled out and segmented the poor and jobless; later politicians created a division between blacks and whites with programs like affirmative action; laws were passed to control births of working class people; the quality of the educational system became divided between schools for elites (and future elites) which was based on problem solving and analysis and schools for the rest of the society that only provided repressive, authoritarian, encyclopedic information. He continues by stating that the finance sector (Wall Street) of the country began to acquired an “inordinate” control over the state and employment became destabilized and insecure. Essentially, the political will and imagination of the US failed to follow-up on the initiatives of FDR’s New Deal. Similarly in 1964, Brazil entered the period of the Regime de Militia which was the beginning of twenty years of military dictatorship. And for the second time within the same century, Brazil was controlled by totalitarianism and military rule. However, with the Lula administration at the very beginning of the 21st century (2003), Brazil began a period that was considered real progress with the alleviation of poverty and diminished inequality through cash transfer programs and increases in wages. According to Unger, it was essentially a cycle of consumption oriented and credit based growth that created a new “second” middle class unlike the traditional middle class of Brazil. Traditionally, the middle class of Brazil was purely of European descent, white, and focused on traditional professions (doctors, lawyers,) and government employees. Now, a new, second middle class emerged, mixed race, people who studied at night to earn college degrees, and those that built successful small businesses. However, Unger points out that the dilemma for this new second middle class is an uncertain future – that is, it’s existence depends solely on earned wages from jobs and cyclic consumer credit (unlike the traditional Brazilian middle class that holds wealth through land ownership) without which it can not sustain itself. The problem for Brazil is it has not reached the next level, according to Unger. It still has not found a way to democratize access to resources and opportunities of production and education for all the members of its society. He seems to feel that the country has not yet developed the “structure” that would make this transition inclusive. But more important, he feels that the structural limitations of the current social and economic situation is about to be revealed and under these circumstances, Brazil’s inability to fulfill its promise of democracy will be no different from that of the American dilemma. Many Brazilians, especially politicians and intellectuals, seem to feel that Unger’s ideas and comments are out of touch with Brazil because he has lived abroad for so many years. Although he is Brazilian by birth and served as Minister of Strategic Affairs during the Lula administration (a position that some Brazilians believe was not a very important appointment), he doesn’t have an up-to-date grasp of the current situation in Brazil. Whatever the general consensus concerning Unger, it should be obvious that no transformation of societal structure without a change in consciousness is possible. And further, the major element of stability for both countries lies in their ability to fulfill the institutions that empower its people to grow and prosper. 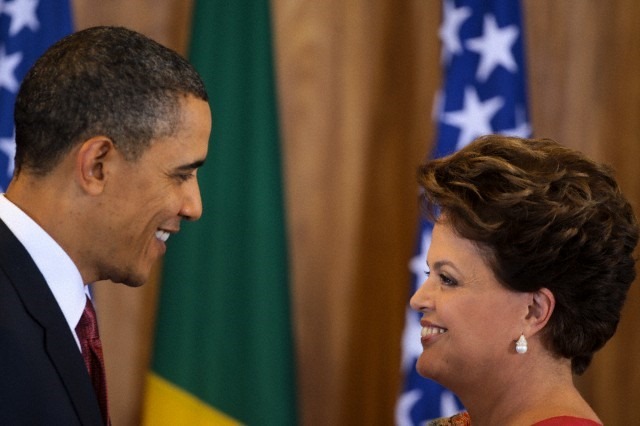 Therefore, the ultimate challenge for both the US and Brazil lies in finding, once again, the political leadership that will make good on the promises of democratic principles.